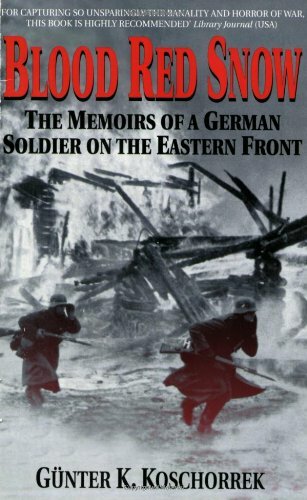 Blood Red Snow: The Memoirs of a German Soldier on the Eastern Front. Three stars. One can drown in memoirs written by soldiers on the Eastern Front. Many are simply stories of how brave the author’s comrades were and how terrible war is and how the author knows nothing of atrocities and shared his food with Russian peasants. OK. You read a half dozen of those and they start to sound the same. Others, such as Blood Red Snow, are different. The author, Günter K. Koschorrek, was a private in the infantry, a machine gunner, an important position in the Germany Army because their small infantry units were organized around their machine guns. They had far more machine guns than Allied or Soviet units and it’s one of the reasons the Germans were so effective at defense. In German infantry squads, the first duty of the riflemen wasn’t to randomly lay down down fire against the enemy but to protect the machine gunner. He did the serious killing. And there is much of that. The Soviets constantly attack in brown waves of screaming humanity. German machine guns had a high rate of fire – the MG 42 introduced in 1943 could theoretically fire a thousand rounds a minute. Instead of using water to cool the barrel, the Germans designed the machine gun to have a removable barrel so when the barrel became red hot, you switched barrels. This could be a tense moment if you were in the middle of mowing down a bunch of Soviets. The riflemen around you carried the spare barrels and the machine gun ammunition. There is little artifice in this memoir. The author describes many occasions when he and his comrades threw off their equipment so they could run faster to get away from the Russians. His description of running for days after the collapse of Army Group Center in mid-summer of 1944 is haunting. He runs even after his ill-fitting boots have rubbed off the top layers of the skin on his feet and his boots fill up with blood. He runs so hard and so long only a teenager like him could have done it. Anyone older would have dropped dead. This isn’t a memoir about a young man who went to the Eastern Front and proves Aryan superiority. It’s a memoir about a youngster who goes to the Eastern Front and is scared almost all the time, miserably cold, and so hungry he will eat almost anything. In between all of that, he fights against wave after wave of Soviet troops, thinking each attack will be the last he will survive. It is very hard to feel any sympathy for the Germans. What were they doing in Russia in the first place? But a seventeen year old drafted into the army and sent to Russia doesn’t have a lot of choice in the matter.